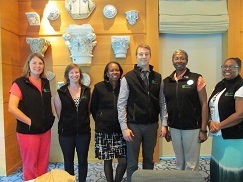 On Thursday, April 13, Emory recognized its Council of Wellness Champions for their contributions to the health and well-being of employees at the second Annual Wellness Champion Appreciation Luncheon. 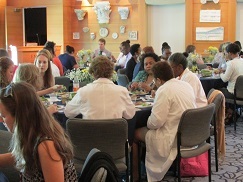 The event, held at the Michael C. Carlos Museum and attended by more than 50 Wellness Champions from Emory University and Emory Healthcare, featured speeches by Mary Beth Allen, Chief Human Resources Officer of Emory Healthcare, and Matthew Early, Vice President of Campus Services. Emory’s Wellness Champions serve as the “go to” people for all things health and wellbeing within their department. They assist with the implementation of important programs such as the Move More Challenge and Know Your Numbers and serve as motivators and encouragers to their co-workers. “Without our Wellness Champions, we could not have reached as many employees as we have over the last few years.” says Melissa Morgan, Manager of Wellness Programs. “To be successful with a program like the Move More Challenge, where we had more than 8,000 active participants, we rely on our champions to be an extension of our health & wellbeing team throughout the Emory community.” This annual appreciation luncheon event not only provides recognition, but also gives the wellness champions an opportunity to network and connect with others from various departments. Julie Parish, a Wellness Champion for Emory Johns Creek Hospital, says she enjoyed meeting new people and getting to know the other Wellness Champions. “It was really cool to get to see another part of Emory,” she said. “I appreciate this beautiful event as an opportunity to exchange ideas with Wellness Champions across Emory and with Emory’s health & wellbeing staff,” shared Natalia Revzina, a Wellness Champion for the Office of Clinical Research. In addition, she enjoyed the presentation and has asked Matthew Early to present to her group in July.